Detroit Red Wings forward Gustav Nyquist has been suspended six games for high-sticking Minnesota Wild defenceman Jared Spurgeon. The incident took place during the first period of Sunday’s game between the two clubs. 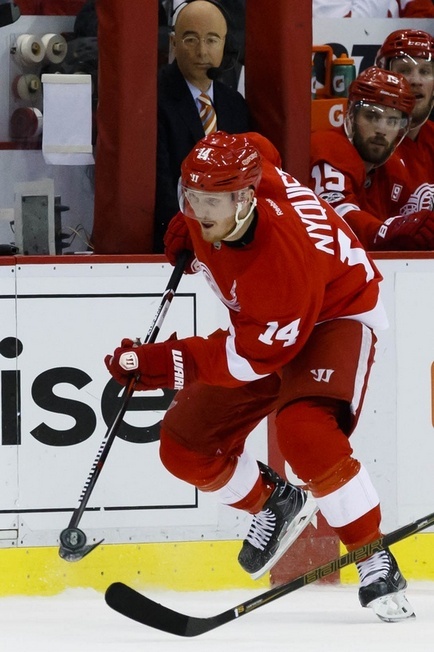 Nyquist had a phone hearing with the NHL’s Department of Player Safety on Wednesday. He was initially offered an in-person hearing, but turned it down. Obviously, the mere offer of an in-person hearing – whether or not it’s accepted – meant a suspension of at least six games was possible. The Department of Player Safety deemed the play to be “extremely dangerous,” noting that it was potentially “career-threatening” for Spurgeon. And indeed that seems to be the case, as Spurgeon initially knocked Nyquist down with a cross-check along the boards. Nyquist retaliated, swinging his stick and hitting Spurgeon in the face with the blade. The Department of Player Safety characterized the incident as intentional, noting that Nyquist’s actions were not the result of simply losing control of his stick or “swatting at a puck in mid-air.” This was a retaliatory act. According to the league, Nyquist stated that he was trying to “respond with a cross-check of his own” and was trying to get into position. He was “attempting to get his stick around Spurgeon” and contact was subsequently made. The issue with the explanation is that Nyquist admitted to attempting to use his stick as retaliation. “(It was) completely accidental. Obviously didn’t mean to do that. My stick gets caught. I’m trying to get body position on him and I’m happy he was out there again. Obviously had no intention of doing that, so my stick gets caught and it looks bad but I’m happy he’s okay,” Nyquist said on Sunday. Of course, Nyquist doesn’t exactly have a record of issues with discipline. In 317 career games, he has just 92 penalty minutes. His only brush with supplementary discipline has been a $2,000 fine for diving last season.